Modern, or mid-century modern, refers to the period of time in which the design style was created—between the 1920s and 1950s. Modern design is defined and doesn’t change. Characteristics of modern designs include simple, unadorned interiors with clean lines and neutral colors. The style incorporates materials like wood, leather, polished metals and acrylics. Home designs have an open floor plan and an air feel, which may include large windows and exposed beams. Modern home designs use only hints of color that add interest to a space. The designs emulate form and function. Contemporary home designs constantly change with evolving trends. Contemporary designs are more eclectic than modern ones. Contemporary homes are hybrid in nature and may borrow styles from different time periods. For example, a contemporary home may borrow architectural elements from a modern home, like large windows and an open floor plan, but may also incorporate odd shapes, bright colors and covered ceiling beams. The form of contemporary architecture doesn’t always follow the structural elements. Contemporary design tends to have a more sculptural feel because creative angles used, artistic touches and overlapping or tiered elements. Contemporary home designs have freedom of creative expression. 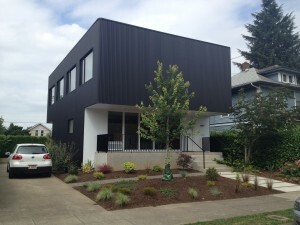 To learn more about available modern homes in the Portland area, contact H. Hudson Homes.